The four five-year old Nordex N90 wind turbines on site will be covered by the servicing contract that includes a carefully planned predictive maintenance schedule as well as reactive repairs and responding to any major component failures. The asset will be remotely monitored via Natural Power’s ControlCentre, the largest, independently operated 24/7 control room in the UK. This takes Natural Power’s servicing contract portfolio, which also includes Paul’s Hill and Rothes wind farms near Elgin, and Crystal Rig I in the Scottish Borders, to 175 turbines. 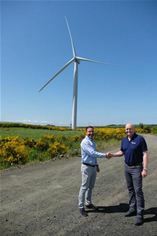 This represents the start of a new operational relationship with one of the biggest operators of onshore wind farms in the UK. Since taking over its first servicing contract on Crystal Rig I in 2015, Natural Power’s independent servicing team has grown from six to 37 staff. Westfield Wind Farm is located on a brownfield site at the former Westfield open-cast coal mine which closed in 1998. The site was previously one of the largest open-cast mines in the UK and is now earmarked for an ambitious redevelopment. Westfield lies approximately 3.62 km south west of Glenrothes and 13.40 km north east of Dunfermline. The wind farm was constructed during 2012-2013, and is administered from a control building located within the site boundary. Westfield’s four turbines are rated at 2.5MW and the site has an installed capacity of 10MW, generating enough energy to power 4,690 homes. Headquartered in Edinburgh, Scotland, Ventient Energy continues to grow as one of the UK’s leading renewable energy companies with ambition to operate renewable energy projects across Europe. With ~690MW of installed capacity on 34 wind farms stretching the length of Great Britain from Cornwall to Caithness, Ventient Energy is uniquely placed to capture the abundant wind energy that crosses the UK, one of Europe’s windiest countries.